As mentioned a few weeks ago in my posting, Throw Him in Jail IMMEDIATELY, Army Lt. Col. Terry Lakin is a birther. And in keeping with his irrational and, most likely, racist mind set, he is refusing to deploy to Afghanistan as he has been ordered to do. Like the rest of the mentally challenged "birther" movement, Lakin refuses to accept the legitimacy of President Obama, despite his birth certificate being available, to anyone interested in looking, for many years. The fringe movement is steeped in racism, and Lakin knows he has no legitimate reason to refuse his orders. Now, the army is set to court martial him. About time. (MSNBC) U.S. military officials tell NBC News that the U.S. Army will court martial a lieutenant colonel who refuses to deploy to Afghanistan because he considers orders from President Obama to be "illegal." Army doctor Lt. Col. Terry Lakin believes Obama does not meet the constitutional requirements to be president and commander-in-chief, because he believes (incorrectly) that Obama wasn't born in the United States. I love that they asked for “Public Defenders” (and they thought they could bring down our government), undercover FBI agent, sweet. Since their inception the Tea party crowd (not a movement since they do have the numbers or clout) because they are haters not debaters or as others have dubbed them screamers not dreamers. The simpleton Tea baggers are the same whiners that were crying when the McCain/Bailin ticket lost. Now that their yelling and screaming failed to stop the health care debate and the bill from passing they are crying again. Let’s face it the Republicans had eight years to deal with health care, immigration, climate change and financial oversight and governance and they failed. The Republicans are good at starting wars (two in eight years, with fat contracts to friends of Cheney/Bush) but not at winning wars as seen by the continuing line of body bags that keep coming home. Instead of participating in the health care debate of ideas the Republicans party turned inward to their old fashion obstructionist party. In my opinion the Republican Waterloo loss was caused by the party allowing a small portions (but very loud) of the republican party of “birthers, baggers and blowhards” to take over their party. I will admit that this fringe is very good at playing “Follow the Leader” by listening to their dullard leaders, Beck, Hedgecock, Hannity, O’Reilly, Rush, Savage, Sarah Bailin, Orly Taitz, Victoria Jackson, Michele Bachmann and the rest of the Blowhards and acting as ill programmed robots (they have already acted against doctors that perform abortions). The Tea party crowd think they can scare, intimidate and force others to go along with them by comments like “This time we came unarmed”, let me tell you something not all ex-military join the fringe militia crazies who don’t pay taxes and run around with face paint in the parks playing commando, the majority are mature and understand that the world is more complicated and grey than the black and white that these simpleton make it out to be and that my friend is the point. The world is complicated and presidents like Hamilton, Lincoln, and Roosevelt believed that we should use government a little to increase social mobility, now it’s about dancing around the claim of government is the problem. The sainted Reagan passed the biggest tax increase in American history and as a result federal employment increased, but facts are lost when mired in mysticism and superstition. Although some Republicans are trying to distant themselves from this fringe most of them, having no game plan/ vision for our country, are just going along and fanning the flames. For a party that gave us Abraham Lincoln, it is tragic that the ranks are filled with too many empty suits. But they now claim they have changed, come on, what sucker is going to believe that? All I can say to you is remember Waterloo. Montana? You use for your moniker the name of a fantastic state. I think perhaps this was actually written by the DNC, however. Not only that, but how is any of your screed relevant to the topic of Splash's posting? It might not have been 100% on topic, but he has some good points about the childish and often dangerous behavior of today's right wing. It was about as relevant and truthful as half of the bribes, earmarks, and BS stuffed into the "healthcare" bill. My bad here you go. Terry Lakin will find out that beliefs and facts are two very different things and in the end his courts-martial will be his own public humiliation for believing something he can not prove. I would love to be there during the military trial and find out what facts he has, internet gossip? 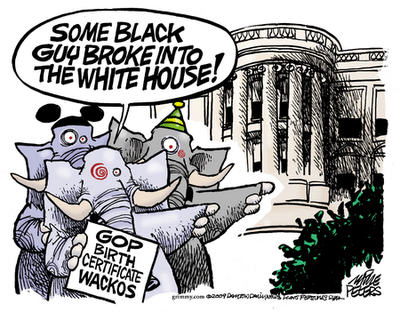 Let's face it no one will take the Birthers seriously until they win a case, but until then, they will continue to appear dumb, crazy or racist, or maybe all three. The old GOP Confederacy, that is what these liars want, good luck with that.